As a dancer, percussionist and caller Mike Salter does a variety of activities in the folk music and dance scene, including leading Madcap Morris in all its various forms. 4. 33rd Madcap Border Weekend at Malvern: 7th-9th Dec 2016 £38 pp. See below. Update on 1st Oct 2018: A few places are still available on the 2018 Madcap Morris Weekend. Current thinking is that the 2019 weekend will probably be the last of the series so do come and enjoy this amazing weekend of dance, song and hilarity whilst there’s a chance to do so. 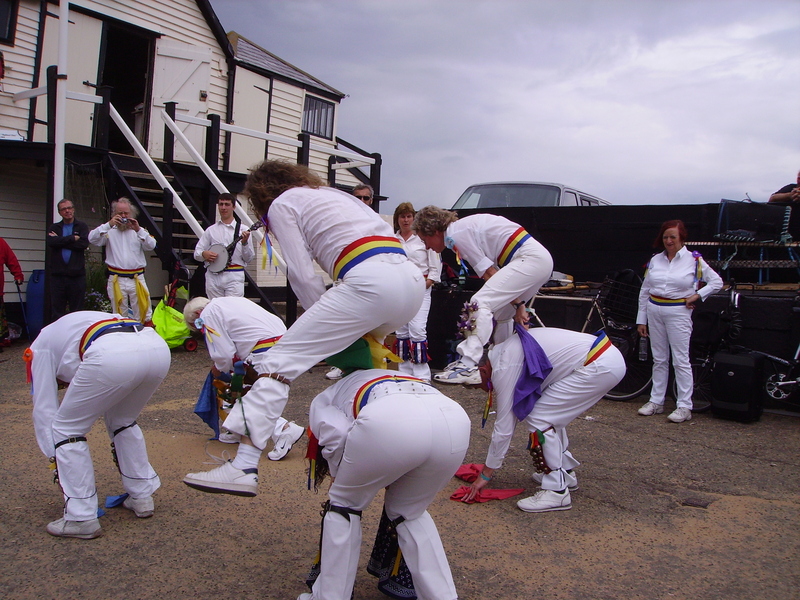 The recent practices and performances at Broadstairs Folk Week may well turn out to be the last outing for the Madcap Cotswold team. Mike is currently negotiating to do something different for one last season of morris dancing in 2019. The Madcap Border Morris weekends have been going since 1986. Inspired by the once-a-year tour of The Welsh Border Morris in Worcestershire, and originally an offshoot of the Wolverhampton Cotswold team Merrydale Morris (which Mike founded in 1984), the Border Morris weekend brings together between seventy and eighty dancers and musicians from all over the country. The event is always held on the weekend closest to Mike’s birthday on the 8th of December. The first four of the weekends were based in Wolverhampton with a Sunday coach tour out to Bridgnorth and Ironbridge. Since 1990 the event has been staged at Malvern. Traditional Border Morris dances such as Brimfield, Much Wenlock, Peopleton, Pershore, Upton-on-Severn and White Ladies Aston, plus newer dances such as Cuckoo’s Nest, Penn Cross and Tinner’s Rabbit taught on Saturday morning form the core repertoire of the weekend, being performed at a local pub on Saturday lunch-time and on a five mile walking tour round the Malvern Hills on the Sunday. 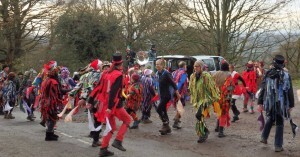 The dancing on Saturday also includes Molly dances taught on Friday evening and dances from Lichfield and the Cotswolds. Singing is considered an important part of the weekend and constitutes a large part of the late night into the early morning activities beside a log fire. A popular feature of the Sunday tour is Mike’s “don’t even sniff it if you are driving” hot punch which goes a long way to explain why quite a lot of people don’t leave until Monday morning. In fact the last few years there has even been some Monday morning dancing in costume. The weekend is open to any dancers, singers and musicians that wish to attend. Bookings are taken during July to September. By October the event is usually fully booked and in most years some people have had to be turned away. Ever since it started in 1986 Madcap Morris has been affiliated to the national organisation Open Morris which had been founded a few years earlier to cater for the needs of mixed morris teams, which at that time were heavily outnumbered by male only teams. Since the Millennium mixed teams in which men and women dance together have been the most numerous category of teams. Mike was co-editor of the Open Morris magazine Dancing On in the 1980s and also served for a while in the 1990s as general secretary. Madcap has never ben a regular team in the sense of one that meets for weekly practices but Mike gathers people to practice and perform under the Madcap name whenever he has a whim to do so. 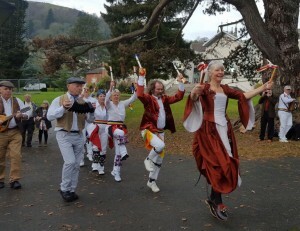 A Madcap Border team performed at the Potteries Folk Festival and at the Hastings Jack in the Green in the early 1990s, and in recent years Madcap Border has danced locally on New Year’s Day, whllst Madcap Mummers often perform a play at a local New Year’s ceilidh. A Madcap Cotswold team performed at the Wheaton Aston Folk Festival in June 2006 and 2007 and since 2009 Madcap Cotswold have performed all week at Broadstairs Folk Week in August. As a reaction against the preponderance of dances with complex sticking routines now performed by most mixed Cotswold teams, Madcap Cotswold does mostly handkerchief dances, particularly those with galleys, forrie-capers slow capers and leap-frogs. At the festival Mike works the team very hard, with an hour and a half’s practice each morning before kitting up and then performing up to sixteen dances down on the sea-front. A mumming play is performed on one of the mid-week days to give the team a bit of a rest from dancing. Madcap Cotswold has also performed twice at a morris weekend at Moira in Leicestershire and wears white shirts, white trousers, white shoes, epaulettes and a set of red, yellow and blue cummerbunds. We’ve just had yet another fantastic weekend despite numbers being down a bit this year, health issues for three of the event’s most loyal supporters who were unable to attend this year, and problems caused by the snow on Sunday. In addition to the fifteen Border Morris style dances that we usually do, all the weekend’s other traditions were maintained: i.e. dancing before the serving of food at 6pm on Friday, a slow and high-flying Trunkles (Bledington) squeezed in amongst four Molly dances on Friday evening, five tables groaning under the weight the Saturday buffet spread, the daftness of the Mumming Play in the Saturday evening Ale, the singing and playing in the new party room in the Old Hall up at the house until well into the early hours for three nights on the trot, the serving of the brandy-laden punch on the Sunday morning, a leapfrog dance in the pub on Sunday, and enough people (over twenty, in fact) staying Sunday night to allow more dancing on Monday morning. A particular highpoint for me was getting a chance to wear my clogs again for a spirited rendition of the North-West Morris dance Shawforth on Saturday night with a set made of of four past or present members of Old Meg, two members of the Rising Larks, and two others who have danced with the Severn Guilders and Crooked Spire respectively and had to learn the dance from scratch in the length of time it took Alan to sing one song. Other personal memorable moments were: on Friday afternoon – when I put twelve short sticks on the floor of the New Hall and six keen people grabbed two each and formed a set before I’d even announced what the next dance was; on Saturday – when Val sang “Now your 64” to me accompanied by several kazoos and two sousaphones; and on Sunday – when during the games in the evening, birthday-girl Barbara said it was the best party she had ever been to. A big thanks to everyone who helped to make the all the feasting and entertainments possible, and thanks again to the two pubs, i.e. Alison & co at the Brewers Arms, West Malvern on the Saturday, and Steph and co at The Wyche Inn on the Sunday. A party that runs at full tilt for most of three days with barely six hours sleep each night takes some running. In fact setting up, running the event, and then tidying and sorting afterwards takes a full week out of each year. Most of the people who play major parts in keeping it going are in their mid to late 60s (and some are already over 70), so we are starting to realise that the current scale and pace of the weekend can probably only be maintained for another two or three years at the most, so enjoy this unique event whilst you still can, i.e. book early for the 33rd annual Madcap Border Morris Weekend on the 7th-9th December 2018. Places cost £38 this year. Bookings will be accepted from the 1st July onwards. A record attendance this year, seventeen in all, thirteen of whom did the whole five and a half mile walk out from Folly Cottage at West Malvern. Two dances were done by the war memorial at Cradley, and another seven at the Cliffe Arms, Mathon, which we “re-open” (its been closed for many years) by drinking a brandy-laced “punch” with our sandwiches. Thanks to June for driving the punch and long sticks around for us, and to Jeremy for providing music.